FringePop: The Clansman by Thomas Dixon, Photoplay Edition for "Birth of a Nation"
The Clansman by Thomas Dixon, Photoplay Edition for "Birth of a Nation"
From the hateful annals of American history, I bring you the photoplay, movie-tie-in edition of the book "The Clansman" by Thomas Dixon, which was the basis for the movie "Birth of a Nation," the D.W. Griffith silent film. 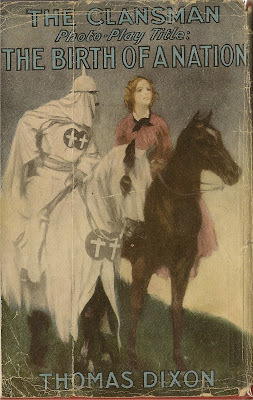 A lot of people want to pretend things like this were never published, that racist ephemera was never made, that the Klu Klux Klan doesn't exist. eBay, in fact, forbids the listing of most historical items related to the KKK. For whatever reason, eBay does specifically state it allows "The Clansman" to be listed despite the KKK imagery. In 2000, eBay was told by victims' rights groups that these items should not be allowed, because they carry violent and painful memories. I can understand why they take this position. The atrocities committed were horrible, and those items do carry violent and painful memories. However, I think it's important that these pieces of history be preserved. They are a reminder of the atrocities that occurred not too far in the distant past. They remind us of how people that are decent in most aspects of their lives, can be so monstrous to fellow human beings. We shouldn't forget this. We need to remember. I've never been able to visit it but in Big Rapids, MI, at Ferris State University, there is a museum that preserves these types of artifacts. It is called the "Jim Crow Museum of Racist Memorabilia." On its website, the curator Dr. David Pilgrim provides another reason why preservation of these objects is important-- it opens discussion and allows us to deconstruct the taboo. To speak about the unspeakable. We can ask questions and understand racism and everything associated with it. We can understand its history and confront it. Forgetting about it and pushing it into the past will not make it go away. Of course, people could potentially collect this material, because they are hateful. However, I think those people would be intolerant and hateful, regardless of whether they could purchase racist, or otherwise prejudiced, historical material. So, I post this piece for the reasons above. I will post similar pieces in the future. It's more comfortable not to talk about these pieces or display them. But, comfort doesn't beget progress. Appreciate your post since this seems to be the week for bringing attention to "Birth of a Nation" and the term "Great White Hope" that both come from the same racist period in US History. Enjoying your blog very much also. Great work. When I wrote the post, I didn't think about that in particular, so thank you so much for making the connection and for the compliment on my blog. I appreciate it.